Brooke Teubert awaits the runner at home for a close play. 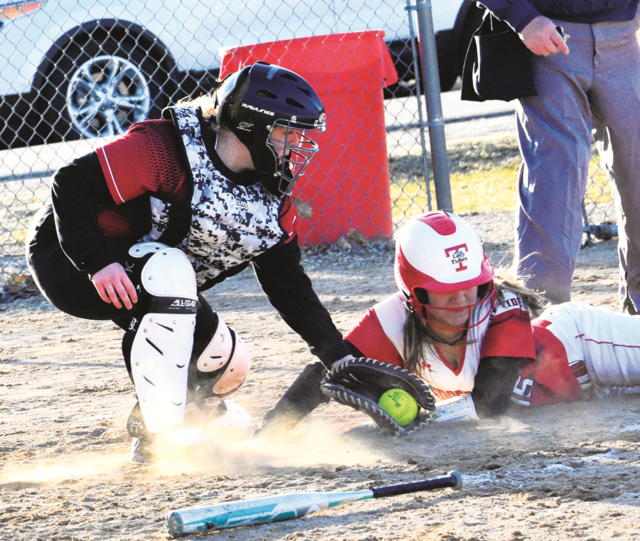 Last Tuesday the Brodhead Cardinals softball squad hosted the Edgerton Tide in what would be an early season conference matchup. The Cards came into the game with an 0-3 record as they looked to get the zero out of the win column on their home field. After allowing two runs in the top of the first the Cardinals were able to quickly respond and take the lead in the bottom half with four quick runs. After Bailey Matthys stole both second and third base she found herself in scoring position and the Cards took advantage when Hannah Myhre singled to center field to score Matthys. Myhre soon advanced to second on a wild pitch and Katie Goecks brought her in with a single to left. The Cards would score two more before the inning ended as they took a 4-2 lead into the second.